Window treatments may not be the first thing people notice when they walk into a room, but blinds, shades, and draperies are there in the background – or the foreground, depending on your style – doing an important job or two. Whether the role of a room’s window treatments is to create warmth, frame a view, block light, or add color and texture to the decor, they make an enormous difference in ambiance. Have you neglected the window treatments in your home? Maybe it’s because you’re not sure where to start. Here are five ways to spice up your window treatments. Can’t decide on the window treatment you like best? There is relief for the fickle among us. The layering trend provides the perfect excuse to purchase all the panels, sheers, and blinds you’ve fallen in love with in your hunt for the right window coverings. Display patterned sheers with solid panels. 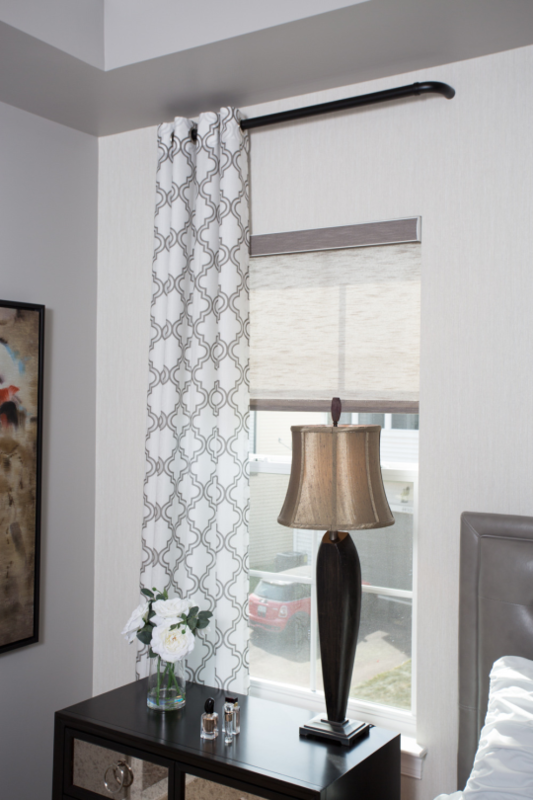 Hang a natural-looking roman shade or neutral honeycomb blind behind panels in a geometric pattern. Mix and match unexpected combos – like stripes and flora’s – and you might just discover a delightfully unique look for your space. No matter how large or small your room is, floor-to-ceiling window treatments can add height and dimension where it was otherwise MIA. The job of window treatments is to shift and enhance a room’s dynamics and mood, and extra long panels can certainly make that happen. Hide the hardware of your panels with an attractive valance for even more visual interest. Eco-friendly is always trendy, and your décor can reflect your love for the earth with your use of natural materials in your window treatments. Use a bamboo rod instead of metal. Or choose woven wood shades. There’s no need to overdress your windows with swags or jabots or tie-backs just because you think you need to accessorize. A vibrant Roman shade in a bold, large, colorful pattern will speak volumes about your sense of style and décor leanings. If you have a beautiful view to frame, it’s especially wise to keep your window treatments airy, light, and simple. You can use window treatments to ground your room. If you have floral wallpaper, ikat floor coverings, or cowhide upholstery, a simple Roman shade can ground your room and allow the eye to rest as it jumps from pattern to pattern. Window coverings don’t have to break your decorating budget. Window treatments are simple to change, as often as the seasons shift, or your whims.